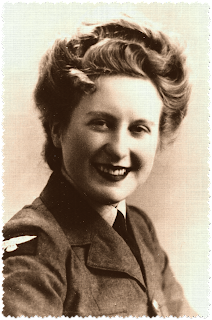 It seems incredible to me that she left her sleepy, idyllic childhood home in the South Hams when she was barely more than a child to join the WAAF (Women's Auxiliary Air Force) at the beginning of WW2. She lied about her age and was accepted. She went from running barefoot on the beach in her Devonshire home to manning barrage balloons in an effort to force enemy bombers to increase altitude thus reducing the accuracy of their bombs. Later she was trained to service instruments, specifically in Lancaster Bombers. 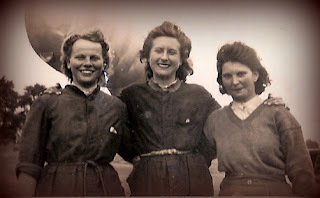 Granny was part of the ground crew at RAF Binbrook...this is where she became "the undecided blonde". Having only enough bleach to colour the front of her hair she had a trade-mark blonde roll poking out from her headscarf. When seen without her scarf or cap she was quite clearly mousey...the lads had a great time ribbing her. In January of this year Vikram Seth appeared on Desert Island discs. His third choice was "BBC sound archive - Nightingales and Lancaster Bombers recorded in a Surrey wood in 1942". This clip was a revelation to me. "Heartbreaking in it's counterpoint" as Seth describes it. Listen here. Beatrice Harrison was a leading cellist of her generation, and friend of composers such as Delius and Elgar. She had the habit of playing her cello in the wooded garden of her cottage in Oxted, Surrey. One evening in 1923 she was joined by a nightingale and was so enchanted by the sound that she persuaded Lord Reith, the director of the BBC at the time, to broadcast the cello-nightingale duet on live radio. Accordingly on May 19, 1924 the first ever live outdoor broadcast was arranged. This went on to become an annual event. On May 19, 1942, three years into the Second World War, the BBC was back in the same garden planning to broadcast the nightingales (sans cello). But 197 bombers, Wellingtons and Lancasters, began flying overhead on their way to raids in Mannheim and the engineer realized a live broadcast of this event would break security. The recording went ahead anyway since the lines to the BBC were open and a two-sided record was made, the first side with the departing planes, the second with their return (eleven fewer).This is the recording that Vikram Seth chose. 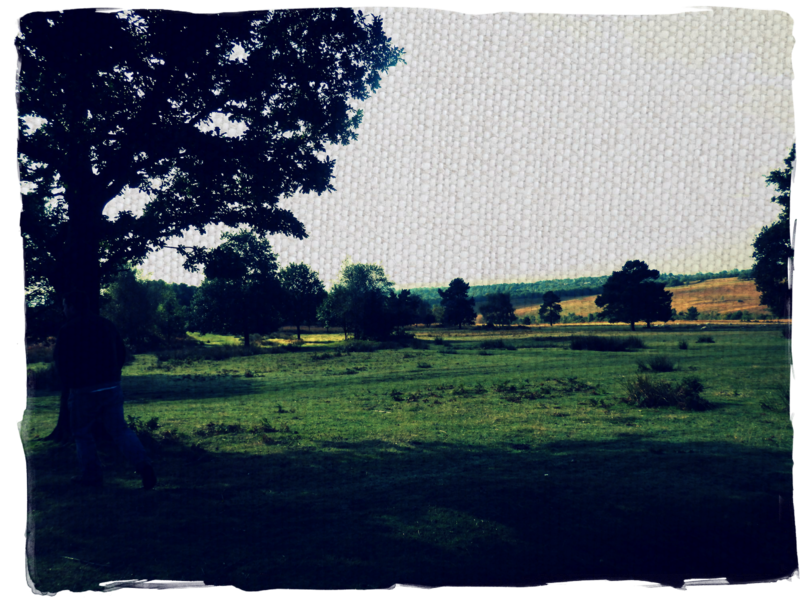 Most weekends we bowl across to Ashdown Forest (AA Milne's 100 Acre Wood ).We love to walk up there...originally a deer hunting forest in Norman times, Ashdown Forest is now the largest free public access space in the South East. It is a great place for walking and on a clear day the views are breathtaking. We are still only scratching the surface of all the walks here. In the summer we discovered a lovely new route across the southern slopes of the Forest towards the village of Nutley. The views towards the South Downs are beautiful and we were so busy waxing about them we barely noticed the tiny walled garden that surrounds the Airman's Grave until we were right on top of it. You can see more of the Airman's Grave here. On the night of the 31st of July 1941 the aircraft was returning from a raid.The weather was bad and the plane was flying on only one of its Rolls Royce Merlin engines. It was imperative for the pilot to reach an airfield as close to the English coast as possible. Sadly, the aircraft could keep going no longer and crashed, nose down on the southern slopes of the Forest. Tragically all six crew members were killed on this their 13th Wellington Mission. A while after the crash the 2nd. Pilots' mother, Mrs Sutton, came to live in nearby Nutley Village and it was she who put the original wooden cross at the place where her son died. In 1954 a stone cross was erected and a fence put round the area to keep the grazing sheep out. In 1971 a beautiful wall constructed of the local Forest stone was built in place of the fence, and this was done by the Forest Rangers. Gradually under the care of the Rangers, trees and flowers were planted to make the site one of great beauty. The day we first saw it, a wonderful white rose was in full bloom leaning towards the cross. Probably the horse riders started it all, for in latter years the site has become one that sees huge gatherings every year on Remembrance Sunday. The service from the Cenotaph in London is relayed, the Silence is kept and the Remembrance ends with the emotive notes of a bugle. They gather in their hundreds, the people who come to remember on the Forest. Riders with horses, walkers with and without dogs, children, all stream quietly down Forest tracks. That so many people, four hundred last year, with accompanying animals and children can gather so quietly and so respectfully is a wonder. The dogs do not bark, the horses give a rare whinny. The children seem to catch the strange, wonderful atmosphere and watch and listen. My knowledge of this is all thanks to a wonderful man called Frank Wilson who is an acknowledged expert on the crash. In years gone by, he would go to great lengths to collect his private aircraft, load it with sacks of paper poppy petals and head for Ashdown Forest. At the appropriate time he would fly over the spot where the crowds would look up in anticipation of his arrival. Passing overhead, Frank would send thousands of poppy petals fluttering down in a red cloud, gently landing on the grave, the forest, and on the heads and shoulders of those gathered. I am sad that I will never experience this spectacle but so very grateful to Frank for all he has done to tell their story. The Remembrance is held every Remembrance Sunday in November under a vaulting Forest sky. 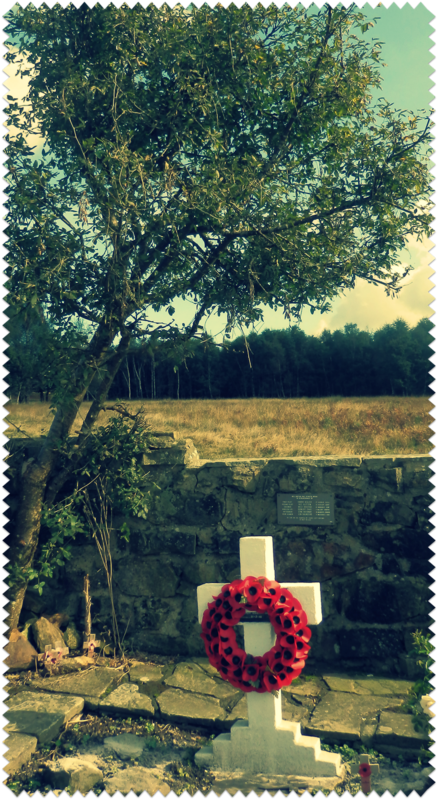 This year I hope to be there to honour those that have given their lives that we can stand free in that lovely place. We once had a "fly over" by a Lancaster bomber at our village fete. The drone could be heard far in the distance, long before we could see it. And then, it appeared, banking slowly, the noise was incredible, thrilling, bass tones catching in my chest and my throat I coughed an involuntary sob. I looked around, all eyes were transfixed and heavy with tears. Later I described this moment to Granny...she gazed into a faraway place in her memory, smiling. 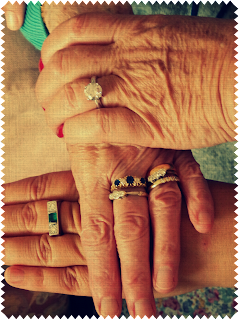 here we are, three generations...me, Granny and Magpie. Yes, despite some terribly close shaves, Granny is alive and well, thriving in fact, back in her home in Devon. I feel so privileged to be able to ask her about her experiences in the war.I love to sit with her and hear the living history and to tell her how proud of her I feel. This Sunday is Remembrance Sunday and also it is Granny's 87th Birthday. Yes! Granny ~ born on the 11th day of the 11th month so you see how the two events are entwined in my mind. 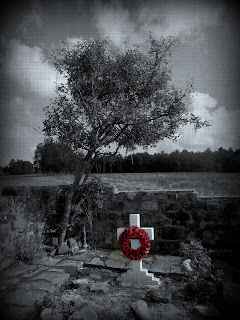 I hadn't realised, before today, that the crew that died that night on Ashdown Forest, back in 1941, had flown out of RAF Binbrook...and so the circle closes. Happy Birthday Granny, I am so honoured to be descended from such a line! Such a beautiful rendition and moving words Sarah - your granny sounds like such a great character...can I see a little in you of her. We've stood on Pooh sticks bridge and played the game, though many moons ago when we were first new comers to the area - we really should go back again. Distance and time I guess. Yes Magpie says it too....very similar in lots of ways...funny how genetics work isn't it? Now if you fancy a game of Pooh sticks with team Lane, just let me know! Happy Bonfire Night to all you Boos! Such a beautiful post! I love the story about your grandmother and her experience,and of course her blond curl. During the war I guess one had to "just get on with it." There are so many sad stories of men and women both soldiers and civilians who lost their lives and sacrificed so very much. How wonderful that the little memorial to those 6 men is kept up so beautifully and those brave men are never forgotten. I hope you have a wonderful celebration on your grandmothers birthday! You are so blessed to be able to share your time with her...I miss my grandmother everyday. Hello Elizabeth ~ I love that Granny felt the need to maintain her blonde forelock in the midst of so much chaos...her life was changing so much and so fast back then. She will really appreciate your Birthday good wishes, I shall pass them on. To use her phrase "tickled pink I should think!" What an absolutely beautiful and moving post you have written today. I am sitting here with tears rolling down my cheeks. Thank you for sharing your Granny's story and the story of the crash. Also for the link to the Nightingale and Lancaster piece which I've just listened to. Beautiful and moving. I think it is so important that we keep remembering all those who fought for us in both the 1st and 2nd World Wars as well as those who still put their lives at risk for us. My Husband is a History Teacher and his specialist subject and passion is the 1st World War. We visit Belgium regularly as well as Northern France and are regulars at the wonderful remembrance ceremony which takes place every evening in the beautiful Belgian town of Ieper(Ypres). We have already started to teach our two year old what it is all about and will do so with our soon to be born no.2. I think it is so so important. Thank you so much Fiona ~ How amazing to have been to the ceremony in Ypres, sends shivers down my spine just thinking about it. Like you I shed silent tears when I think of all the sacrifices, then and now. What a lady your grandmother is, it is so important that we remember those that gave so much at that time. Hope you lovely Grandmother has a lovely birthday. As you probably know I'm recovering from emergency surgery. The posts on the blogs help to pass the day and I always love yours. You have a great talent in your writing - catching the emotions of the moment. What a beautiful little place where the grave is - poignant too. My father was a mechanic in the last war and worked especially onthe Spitfire. I have a little brooch of a Spitfire which he made from a penny, I think. My mother prized and know I look after it. My grandfather was in France in the 1st world war and was gassed twice, sent back to the front within a week of it both times. I never knew him, he died when I was 3 months old - he called me "the little one without a name" as I hadn't been christened at the time. I have the cards he sent from France to my Nan and to his children, also carefully folded is the Union Jack that was on his coffin when he died. It is so important that we all keep these precious things and always remember the sacrifices made by others to try to make life better. 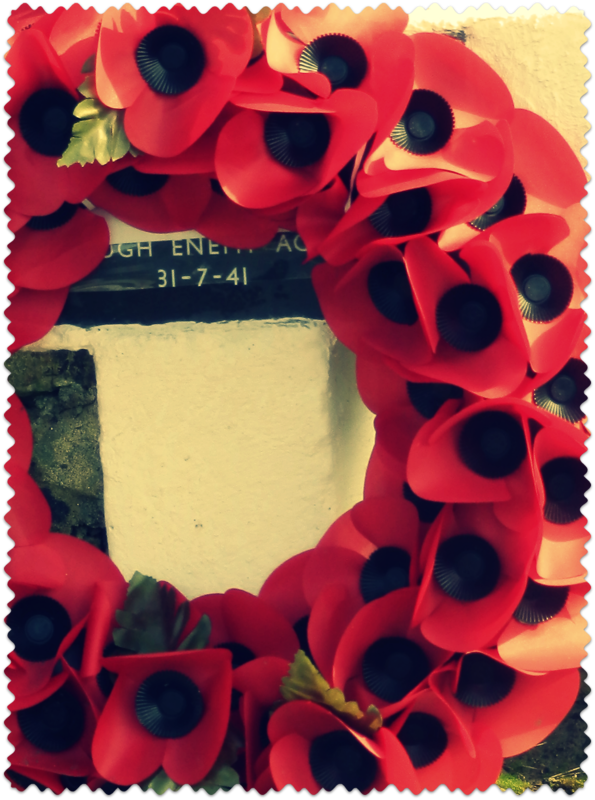 I have my white poppy for the 11th November - in its centre it just says" Peace". Than you again for your beautiful sensitive writing - you always capture the moment. Thank you so much for taking the time to write such wonderful memories here...it is our duty to share our stories don't you think? I am so flattered and thanks you for your kind words about my writing. Such a moving post. My parents also served in the war it's hard for us to imagine how different their lives were to ours and how they coped with what they had to face day by day. What a special place to be on Remembrance Sunday. The plaque seen more clearly on the You tube clip really touched me. What a beautiful lady your Granny was, and still is! Very interesting and moving post,beautifully written with love. Hope your granny as an amazing birthday! Your words are so touching. I was incredibly moved while reading your well written post. My Father was in the USAF and was stationed in England for a while during WWII. After that he always had tea as his choice of beverage. I have his military records and a list of sorties is among them. It really makes it real. What a lovely tribute to your Granny and all the brave others. Tea! Brilliant, it is a cure all. Amazing to be able to look back on his sorties, fascinating I should think. I am truly grateful to your granny and those like her. What a wonderful story. What a wonderful post, I'm glad your Granny is still here to share her stores with you. Bless you Jayne...Granny loves the "hands" photos too. I have made her a little book of hands pictures, including some of her Great Grandchildren! 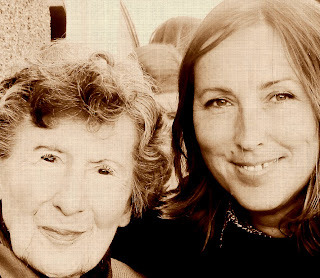 Happy birthday wishes to your Granny, what an amazing woman she is to have fibbed about her age so she could 'do her bit'. This post had me crying at your beautifully emotive words and the simple and yet stunning photos. Thanks for your comment too. T was, as always, so happy to see his birth family. We are very lucky we have been able to share our lives over two families. Your Granny sounds like one amazing lady. There are so many stories like this and it is only right that we honour and remember those that served on Remembrance Sunday. Thankyou for taking on us that journey with you. It is very evocative, thought-provoking. What an experience it would have been when the poppy petals dropped from the sky. I loved the story of your granny's role in the war and of the airmen's cross in the Forest. It must have been very moving to see all those petals falling from the sky. It's so important to cherish the older generation and to take the time to ask them about their lives and experiences. What a wonderful post. The nightingale/Lancaster bombers recording was very eerie, and I can just imagine the poppy petals falling on the cross. A post so worth the writing and the reading, thank you, truly. I am going to listen to that recording again and take a few quiet moments to give thanks for those who gave so much for us. Oh, for pete's sake.... tears!!! Such a lovely post- and your words really brought it to life in my mind. I can almost see the poppies floating down, or hear the planes buzzing. Happy Remembrance Day, and what a lovely way to honor the past, the brave men and women, and your Granny. Happy birthday to her as well!! What a wonderful post. I love the story of your Gran bleaching that one lock of hair. Talk about making the best of things! Great photos of the hands from the generations.